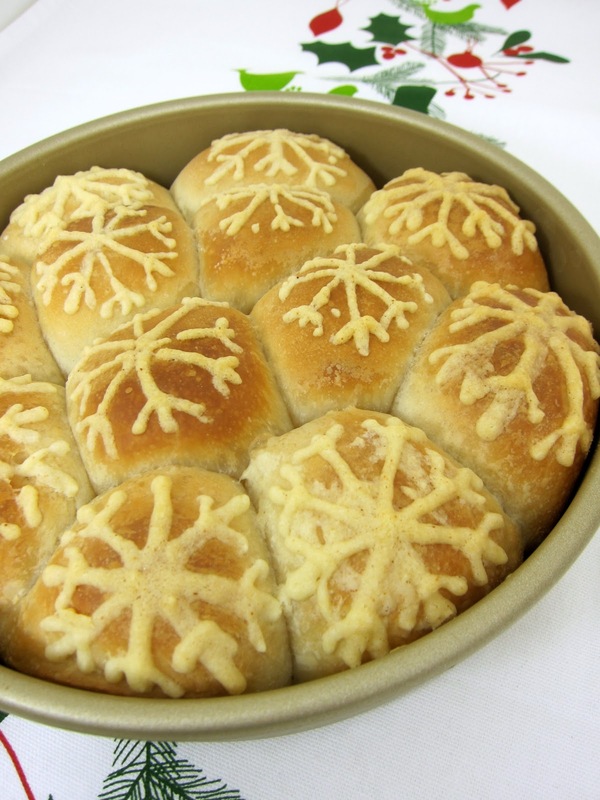 These snowflake rolls are the perfect addition to your holiday dinner table. I made each roll have a snowflake design, but you can pipe anything you want on the rolls; swirls, letters, Christmas trees - the possibilities are endless! These rolls make a great presentation, and they are super easy to make. There is very little hands on time. It just takes a few hours to let the frozen bread dough rise. I really think you use any type of roll for this recipe since the festive part of the dish is the butter mixture that is piped on top. Lightly spray a 9-inch cake pan with cooking spray. Arrange 12 rolls in the pan. Cover and let rise in a warm place until double in size. Once rolls have risen, preheat oven to 350. Wow these look so good and you are so creative ! Just to make sure though, you pipe the butter snowflake BEFORE baking? It doesn't just melt off ???? It says, "12 Rhodes frozen bread roll dough" -- do you mean 12 rolls from the package???? Denise - yes, pipe the butter mixture on the rolls before you bake it and it doesn't melt - it is really amazing! wow, that's so cool, and cute! I saw your idea just in time to thaw the rolls and have them for dinner. We loved them! I didn't have a piping bag so I just used the good old ziploc bag trick, worked great. I'll definitely be making these again, thanks! Pam - it took probably 2-3 hours. They have to thaw and then rise. I put them in my oven on 100 degrees to help the process. Thank you :) Will have these on Christmas!